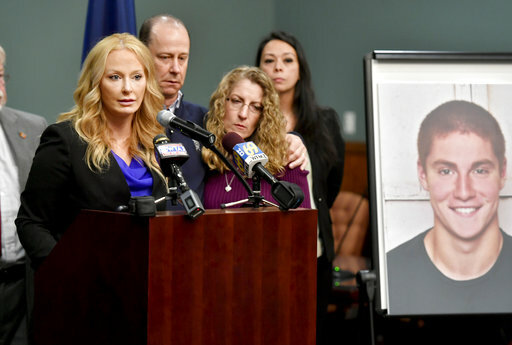 BELLEFONTE, Pa. (CN) – A Pennsylvania judge on Wednesday dismissed many of the most serious charges against nearly a dozen Penn State frat brothers accused of involuntary manslaughter and evidence tampering in last year’s hazing death of a pledge. The charges stem from the 2017 tragedy in which Beta Theta Pi pledge Tim Piazza fell several times after a drinking ritual and was allegedly left to die by fellow fraternity members who were accused of later trying to cover up the hazing. Centre County Judge Allen Sinclair had previously dismissed dozens of the most serious charges against the frat members last fall, including involuntary manslaughter and hazing, but prosecutors quickly refiled many of those charges. On Wednesday, the judge dismissed most of the refiled charges – including involuntary manslaughter – against the defendant Beta Theta Pi frat brothers: Brendan Young, the frat’s former president; Daniel Casey; Jonah Neuman; Gary Dibileo; Luke Visser; Michael Schiavone; Parker Yochim; Lars Kenyon; Michael Bonatucci; Joseph Sala; and Nicholas Kubera. Dozens of charges remain, including conspiracy to commit hazing, reckless endangerment, furnishing alcohol to minors and evidence tampering. However, the prison time association with those charges is far less than what the fraternity members originally faced. On Feb. 4, 2017, Piazza, a sophomore fraternity pledge to Beta Theta Pi, had been made to endure a drinking “gauntlet,” chugging vodka, beer, and wine in a short period of time as part of a hazing ritual. Piazza, severely drunk from the hazing ritual, fell face-down down the frat’s stairs around 10:45 p.m., knocking himself unconscious, according to the grand jury report. Piazza’s blood alcohol level was .40 the night of the pledge ceremony, doctors estimated. After finding Piazza’s body, some of the frat brothers allegedly carried his body upstairs, pouring liquid on him and slapping him to try to wake him up. A backpack containing textbooks was strapped to Piazza’s back to prevent him from choking on his own vomit, the grand jury found. Piazza then tried to get up hours later but fell onto a stone floor around 5 a.m. He suffered for hours before succumbing to his injuries to his spleen and brain, while his fellow frat brothers failed to call for help until hours later, prosecutors said. Eighteen of the frat’s brothers and the frat itself were charged in May 2017 with Piazza’s wrongful death. A grand jury hearing the case, which relied on security camera footage from the frat’s chapter house, said the actions by frat brothers may have worsened Piazza’s injuries. The frat has been permanently banned from Penn State after it was accused of a “persistent pattern” of excessive drinking, drug use and hazing. Pennsylvania Attorney General Josh Shapiro said in a statement that his office was “assessing our legal options” but would proceed with the charges that remained. Attorneys for the frat brothers had called the case overreach by zealous prosecutors.